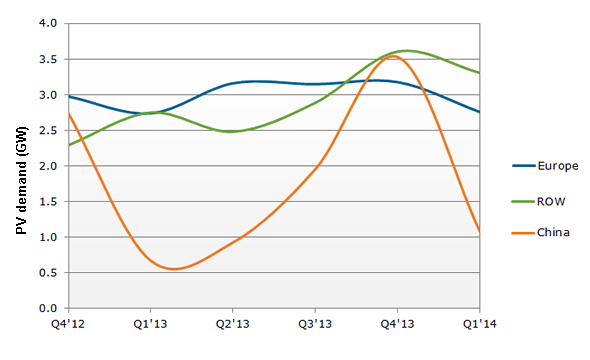 Solar PV demand in the first quarter of 2013 dipped due to the volatile market in China. The rest of the world, though, saw more stable growth - according to Solarbuzz. China will account for more than 20% of global PV market demand, i.e. 0.9GW to 3.6GW. Germany, Italy, France, and the UK will lead solar PV demand in Europe, accounting for over 65% of regional demand. New demand from the emerging PV markets, such as the Middle East and Southeast Asia (ROW) demand will range from 2.5GW - 3.6 GW each quarter. The Japanese market is strongest during the first half of the year. The U.S. market is strongest during the second half. TheGreenMechanics: Not a totally bleak year for the solar PV industry as some have predicted last year. China will come good eventually. For your reading pleasure, jump to Solarbuzz Quarterly report. China is such an unexpected country!